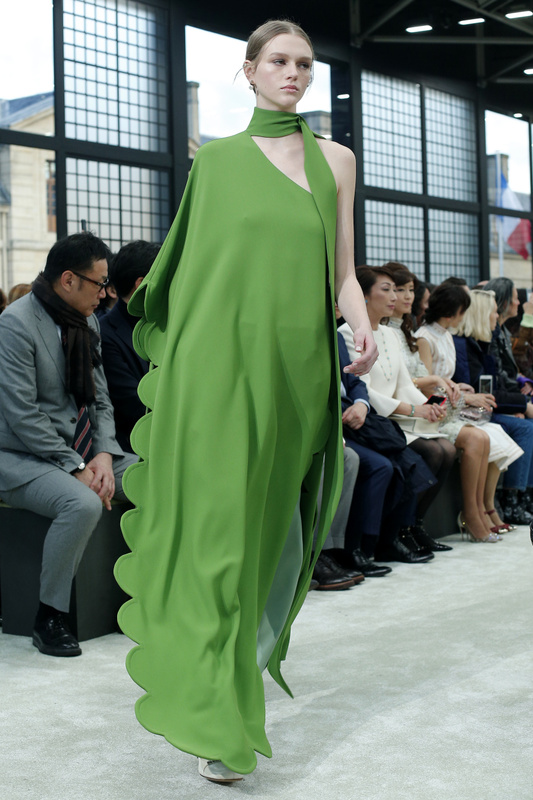 PARIS (AP) — In a low-key Givenchy hoody, actor Idris Elba joined forces with actress Elle Fanning in a blue Valentino gown to buck this week's trend and bring some A-list star power to Paris Fashion Week on Sunday. 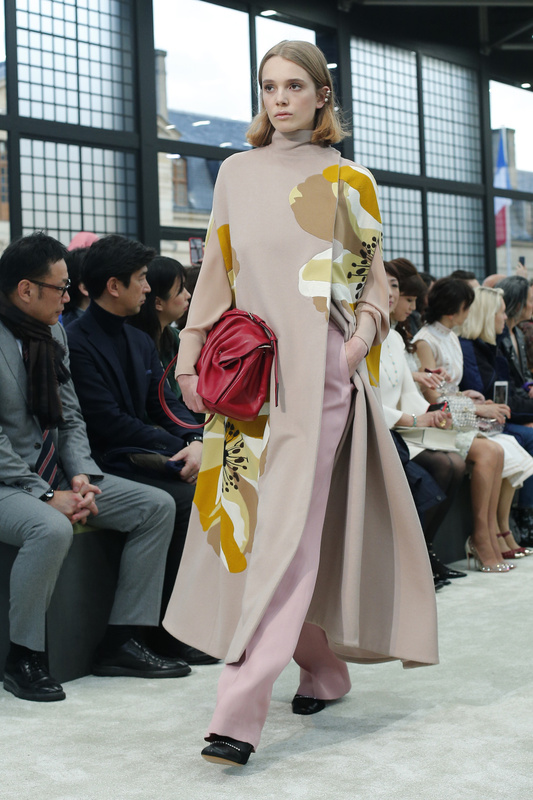 Here are some highlights of Sunday's fall-winter collections, including Givenchy, Valentino and the relaunch of Poiret. Beyond designer Clare Waight Keller's gentle manner lies a powerful creative psyche that's dark, brooding and gritty. 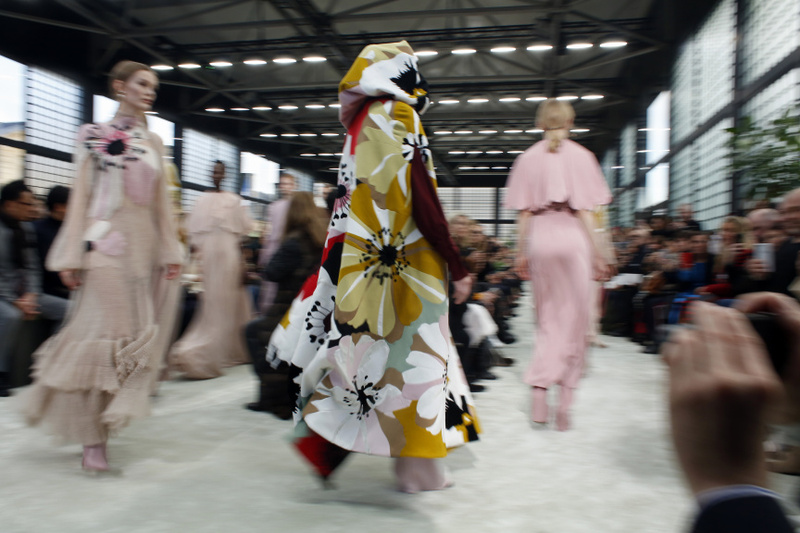 That revelation was brought into focus at Sunday's strong collection for Givenchy in which the British designer shed her usual politeness and delved deep into the night. This season sees "the air thick with sleaze and danger," said the house. The sharp-edged styles — which included big floppy leather belts in brown, black and tan, houndstooth suits with razor shoulders, as well as zebra and leopard prints — set the time dial to the late '80s. A spattering of menswear styles was a nice complement to the urban grit — including an oversize white coat and marl jacket underneath that captured the heady days of the Rolling Stones' guitarist Keith Richards. As many of his Hollywood peers were gearing up for the Academy Awards in Los Angeles, Elba joined fashion insiders in Paris to see the latest chapter of Waight Keller's evolving vision for the house a full year into her creative stewardship. "I'm excited about it," Elba, a rare face at Fashion Week shows, told The Associated Press. Acting is still the 45-year-old star's main preoccupation and he took the opportunity to talk about his latest projects. Currently filming the latest season of British series "Luther," for which he won a Golden Globe, Elba is trying his hand at a new skill: comedy. "The next thing that comes out is a thing called "In The Long Run," which is a TV show about my life," he said. He acknowledged "it's my first time jumping into comedy" — but said "I'm loving it" so far. Paris-born Poiret's house collapsed in the 1920s after the tumult of World War I changed the fashion business landscape — but his legacy lived on. 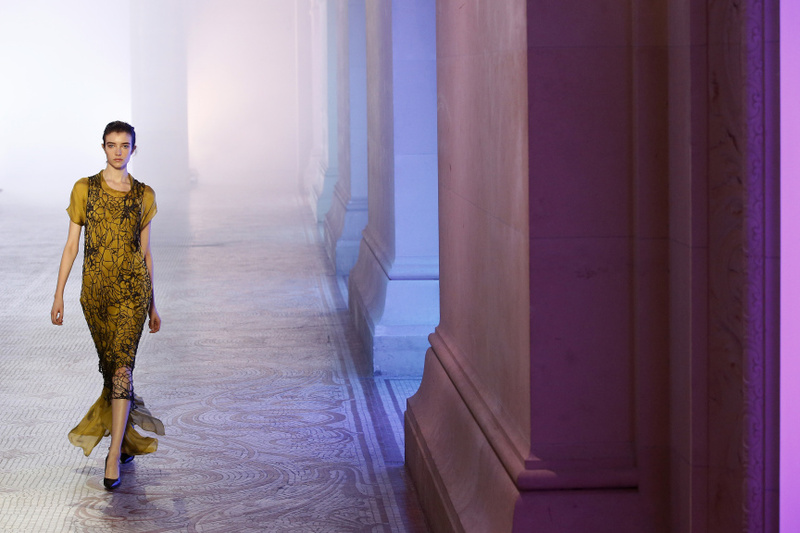 Poiret's relaunch is one of a number of revamped heritage houses in recent years including Vionnet and Schiaparelli. Such a grand come back demands an equally grand display. Guests were treated to a dramatic "couture" presentation inside the historic nave of the westerly part of the former Louvre Palace. Yin perfectly captured the spirit of Poiret, who banished the corset in his designs, in her 39 soft, gently flowing styles in a rich and varied color palette. An enveloping loose shawl in white and gray was wrapped asymmetrically around the shoulders as the hem of a sparkly metallic dress peeped out. An Oriental Chinese red satin pant suit beautifully captured the mood of the 1920s and Poiret's penchant for styles of the East. Yin, who was born in China, was in her element. Yet the designs, which very much bore her fingerprint, were never overly reverential. Yin used large bows and belts to cinch the waist in a contemporary style, showing that this Poiret woman lives firmly in the present day. 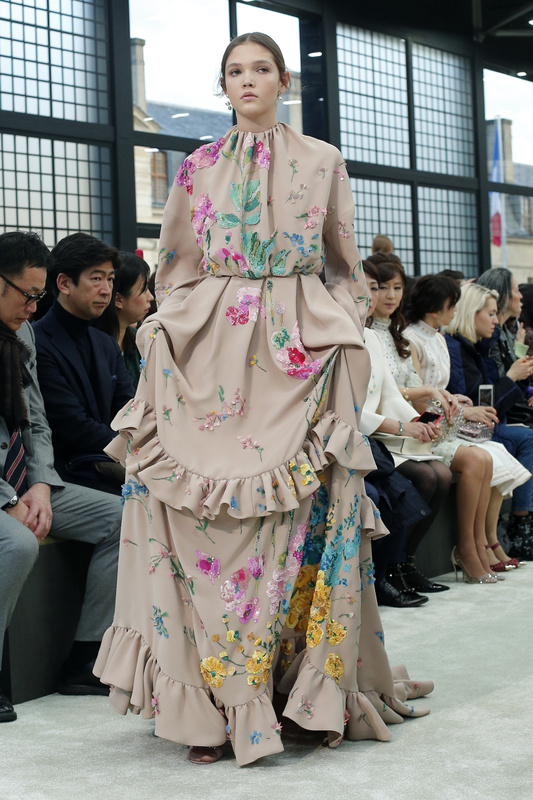 They came on motifs, embroideries, large tulip-shaped sleeves and surreal flower-shaped hoods that evoked the Parisian couture styles of the 1950s. Beginning in monochrome and moving into flashes of deep sunshine, pale yellow, pea green and Cerulean blue, a semicircle "frill" motif adorned hems and went down the front in one loose white gown. It cleverly evoked the shell shapes ubiquitous on the barriers at the sides of flower beds. Sometimes Piccioli ventured creatively too far into his garden: one flower-hood look with an all-encompassing bloom print cut a rather wacky shape. 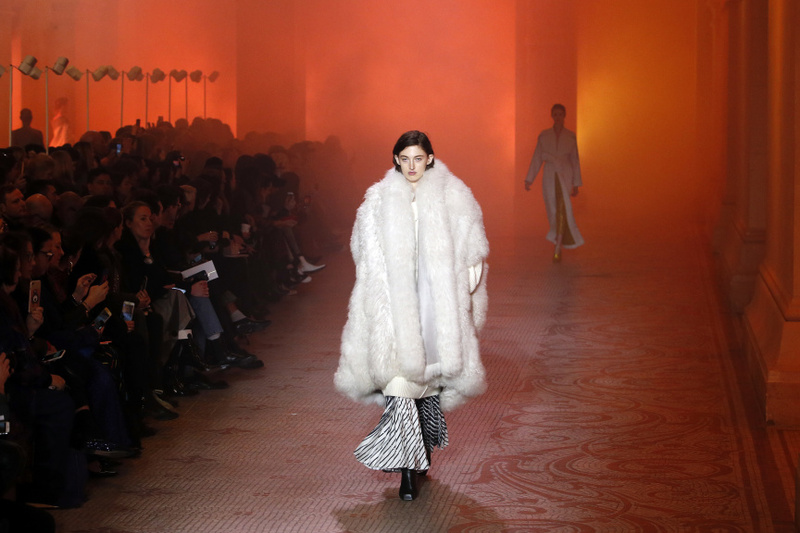 The best look was in monochrome — a fringed coat with dramatic black hood in soft leather. With a "VLT" logo handbag and in a bright blue pleated shoulder-less Valentino gown that matched her eyes, the 24-year-old actress said she was taking it easy this year with the success of the historic crime drama "The Alienist," in which she stars and is currently airing in the US. "I'm just here to attend this show," she said. "I've been lucky to come to the shows before. I love Valentino. It's such a classic, timeless brand," she said.